49. Woodward, Arthur Smith (1864-1944). 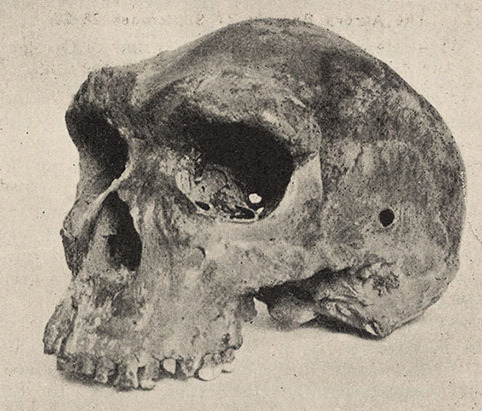 “A new cave man from Rhodesia, South Africa.” Nature, 1921, 108:371-372. In 1921, a laborer working in a mine shaft in Broken Hill, Rhodesia (now Zambia), dug out a robust human skull and a few other human bones. 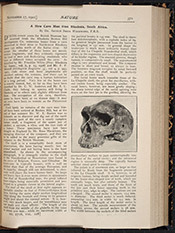 They were sent to the English anatomist, Arthur Smith Woodward, who first described the skull in this article. The skull was soon known as "Rhodesian Man," in parallel with earlier discoveries such as Neanderthal Man and Piltdown Man. Woodward did not know where Rhodesian Man fit into the human tree, but we now recognize it as a specimen of Homo heidelbergensis, ancestral to both Neanderthals and modern humans. The most significant feature of the discovery is that it was not found in Europe, or Asia, but in Africa.